Even prior to our trip down to FL for Christmas, my mom and I were plotting a visit to Vintage Warehouse. It's a big bare bones warehouse in Lakeland filled with vintage looking furnitures, decor, wall accents, accessories, etc. We absolutely love looking at this kind of stuff. The seller's have "booths" outlined by blue painters tape on the floor to show where one booth stops and another starts. Some of the sellers were roaming around and will negotiate on an item. We found most things to be very reasonably priced. I love these old windows as wall decor or over a bed. Old balance gone funky with some paint and metal bull horns. Lots of vintage tools and household type items. Most of the furniture was painted. I love the look of mixing wood stained furniture pieces with a few painted furniture pieces in a home to provide interest... too many wood stained pieces make a room feel heavy to me. This painted gray hutch was fabulous! Love the wire for the top cabinet doors. Vinage jewelry displayed on a two-tier side table. If we were already moved into our new home and I had thought about the design and layout, I GUARANTEE you I would have bought some furniture and wall decor! But since that hasn't happened yet I did not but don't fret... I still came away with 3 awesome items! This gray bowl was calling my name. I loved the size and shape and how the paint was crackled. And for only $10 it only took a few minutes to decide it was coming home with me. Let me preface this find by saying I have been wanting a white wooden tray ever since my mom found one just like this at her goodwill for $8. She uses it on her dining table with the dollar store candle holders on it and various other display options. She spotted this in one of the booths and we were in awe... the tray! Finally! And exactly like hers only slightly bigger! only $12 (negotiated down from $14)! Score! 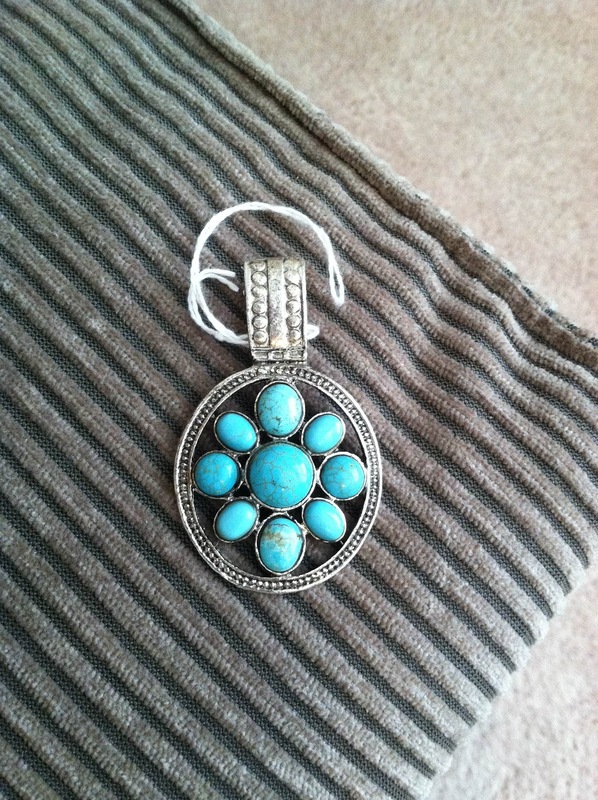 Last but not least I got this lovely turquoise pendant for $6 that I will need to get a chain for. Can't wait to wear this! My mom picked up this toolbox really cheap. So if you are ever near Lakeland, this is a great place to visit! They have a facebook page (just search Vintage Warehouse Lakeland) with their address etc.